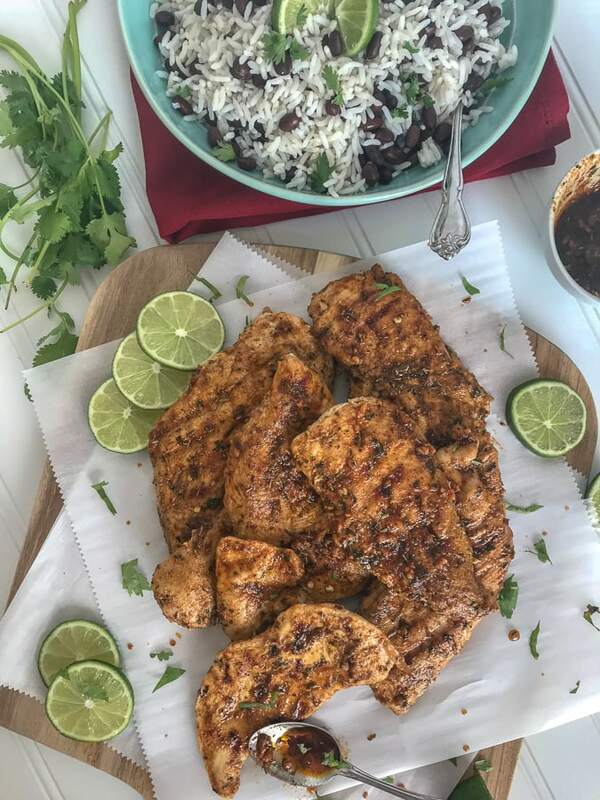 Easy Grilled Jamaican Jerk Chicken – this marinated jerk chicken is truly the most delicious summertime grilling recipe! It’s a zesty-lime and spice flavor bomb from the very first bite! Easy to make, full of flavor, and perfect for meal prepping. 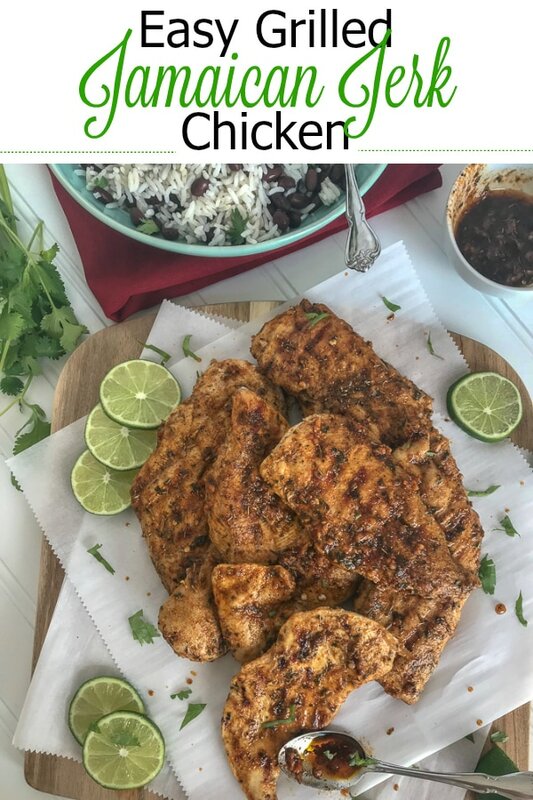 Making this recipe is as simple as tossing the chicken into a ziploc bag or sealed container with the marinade ingredients. Seal it up and allow them to chill out in the fridge for a few hours. Pun fully intended there. That’s it! If you use a Ziploc bag – you won’t even dirty any dishes past the measuring spoons. Win win! 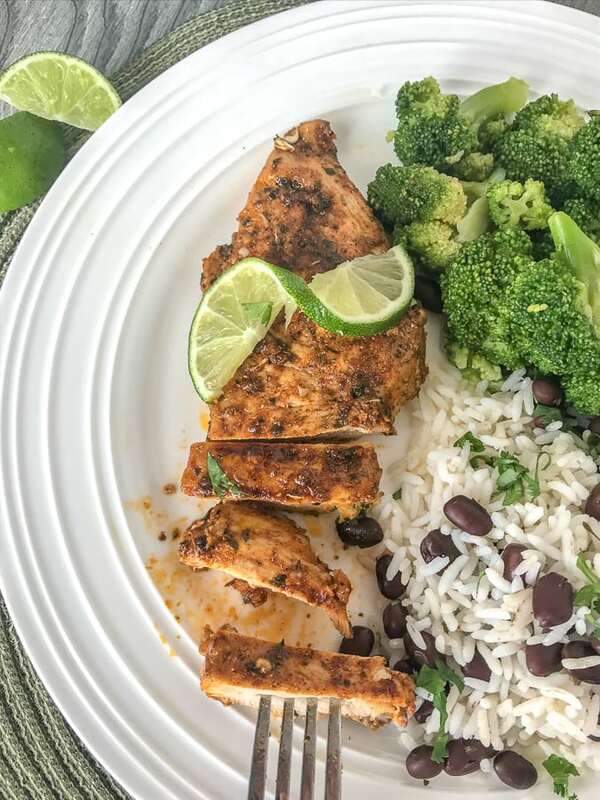 If you’re like me and you like to meal prep chicken for the week, whether its for lunches or to have on hand for a quick, healthy grab n’ go – then you are going to love. love. love this recipe! All thanks to the bombdiggity flavor that is packed into this dish. Sweet, spicy and a teensy bit salty – all wrapped up into one chicken breast. So. Much. Flavor. You can serve this easy dish with just about anything. I plated it with a side of steamed broccoli (gotta eat more veggies!) and a side of white rice with black beans. YUM! 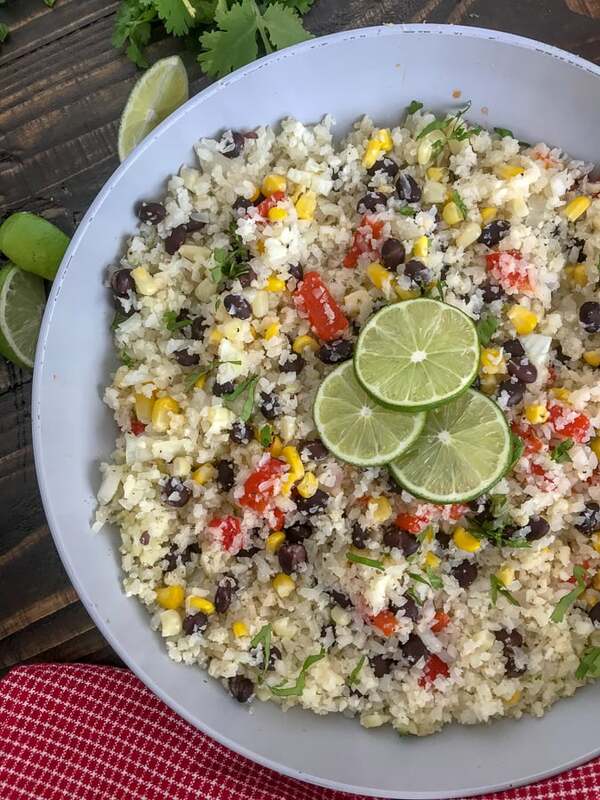 If you’re looking for a low-carb option for a side dish, then I highly recommend pairing this with my Cilantro Lime Black Bean and Corn Cauliflower Rice. I promise you won’t miss the traditional rice with this dish. The cauliflower rice replaces it to perfection! I am more than likely going to be living off of this recipe for awhile. Same goes for my husband with his lunches. It’s an easy, 15-minute side dish that is jam-packed full of flavor. 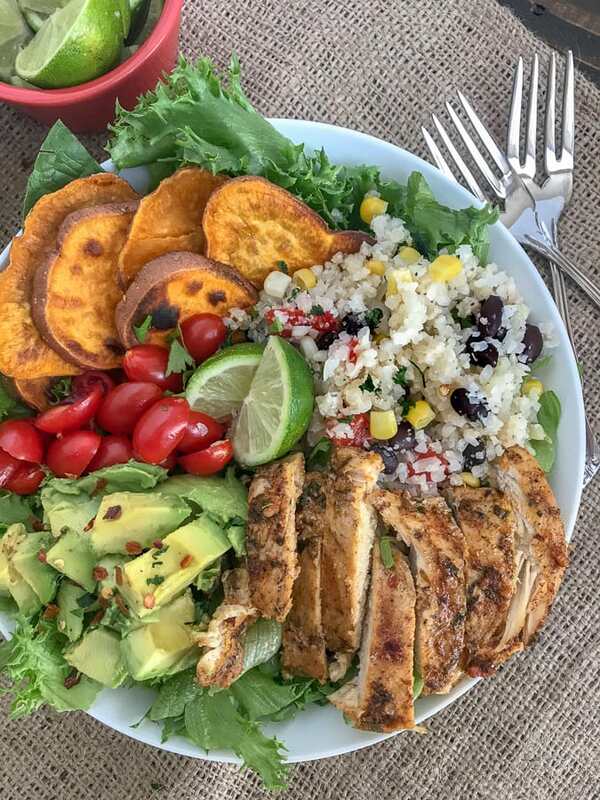 And if you pair it with my Cilantro Lime Black Bean and Corn Cauliflower Rice, then you may as well go all out and make my Jamaican Jerk Chicken Bowls! 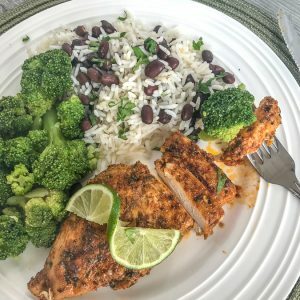 Easy Grilled Jamaican Jerk Chicken - this marinated jerk chicken is truly the most delicious summertime grilling recipe! It's a zesty-lime and spice flavor bomb from the very first bite! 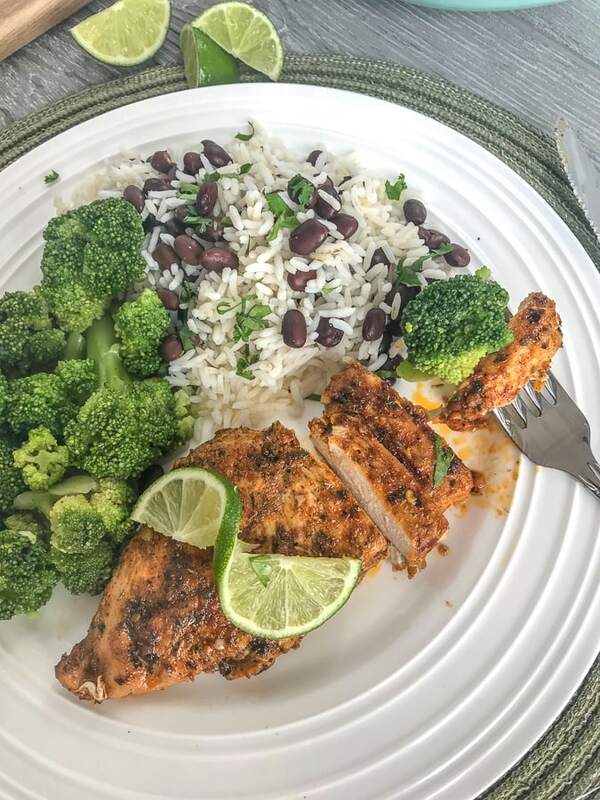 Easy to make, full of flavor, and perfect for meal prepping. (Optional) Rinse and pat dry the chicken breast to remove any packaged juices. Combine all ingredients for the marinade/sauce into a ziploc bag or sealed container. Reserve 1/4 cup of the marinade/sauce to a small, covered bowl for later. Add the chicken breast to the bag/dish. Toss to thoroughly coat. Place into the refrigerator and allow to marinade approximately 3-4 hours, or overnight. Place a skillet/grill pan over medium-heat. Once heated, add the chicken breast. Allow to cook 4-5 minutes per side. Time will be dependent on how thickly cut your chicken breast is. Center of chicken should reach 165 degrees F.
Remove from heat once cooked through. Brush with reserved sauce and enjoy with your favorite side dishes. Pictured: white rice and black beans with broccoli. Place a wire rack on a baking tray lined with foil. Place each slice of chicken on the rack and brush with the additional sauce/marinade. Allow to bake for 10 minutes, remove and brush the other side with any remaining sauce. Place back into the oven to bake for 5-8 minutes. Or until the internal temperature reaches 165 degrees F. Time will be dependent on how thickly cut your chicken is. Enjoy with your favorite sides or on top of a salad! Preheat the grill to medium-low. If you need to (or prefer to), brush the grill with a little oil prior to placing the chicken on. Place each chicken breast on the grill. Brush the tops with half the sauce/marinade. Cook for 4-5 minutes, then turn. Brush the other side with the remaining sauce and allow to cook a few more minutes. Or until the internal temperature reaches 165 degrees F. Time will be dependent on how thickly cut your chicken is. Enjoy with your favorite sides or on top of a salad!